When the winter is at its coldest, that's when ice climbers grab their gear and head for the ice! From firn slopes to frozen waterfalls, tackling the ice without ice tools would be unthinkable. 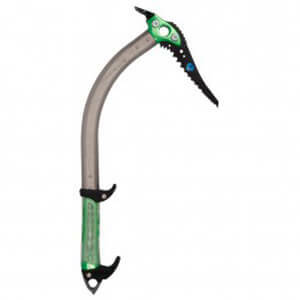 Ice tools - often known as ice axes or ice picks - are used for ice climbing, dry tooling and mixed climbing. Unlike an ice axe, an ice tool has a shorter, curved shaft and a much sharper, angled pick. The special shape of the pick means that once the tool is in the ice it will not easily slip out. The aggressive teeth of the pick bite firmly into the ice, guaranteeing a secure hold. What makes a good ice tool? A good ice tool should be simple and precise, so that every swing counts. A good handle is crucial for an effective ice tool. It should be ergonomically shaped, provide sufficient space for use with gloves and, most importantly, plenty of grip. Ice tools often include hand leashes to provide extra grip - if not included, they can of course be added at any time. Most ice tools are available in two variations: either with a hammer head or a shovel head. The weight of the head is also important. If it's too heavy, it takes an unnecessary amount of strength to swing it. If it's too light, it takes too much strength to get the tool into the ice. Generally speaking, the weight of the head comes down to personal preference.